Friday, 08 March 2013: The Diocese of St George’s-in-Grenada has a new Diocesan Pastoral Council. 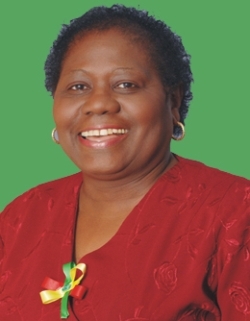 The council is headed by an executive chaired by Ann David-Antoine. In January, at a meeting attended by parish deans and priests, pastoral council representatives and other Church organisations including youth and young adult groups, Bishop Vincent Darius pointed to the need for an active council in the diocese. He noted that the functions of the organisation would be to investigate some aspect of the Church, reflect on it, and make recommendations. In brief, the work of the pastoral council is pastoral planning. Other elected members of the council are Mathias Joseph, vice chairman; Maria Viechweg, secretary; Lana Moore, assistant secretary and Myrna Julien, public relations officer. The floor members are Deacon Anthony Joseph, Raymond Cesar and Everod Phillip. Bishop Darius noted that the council is effective in ensuring that the Church makes wise choices that reflect the values of the Gospel. During the installation of the new Council, the bishop highlighted the critical role of the Church to undertake the task in the New Evangelisation, which he explained, calls on each Catholic to deepen their faith, to believe in the Gospel message and to go forth to proclaim the Gospel. The focus of the New Evangelisation calls all Catholics to be evangelised and then go forth to evangelise. In a special way, the New Evangelisation is focused on re-proposing the Gospel to those who have experienced a crisis of faith.